Apple picking, cider drinking, pumpkin carving, and more. This joyful bouquet sums up everything that’s fun about fall! 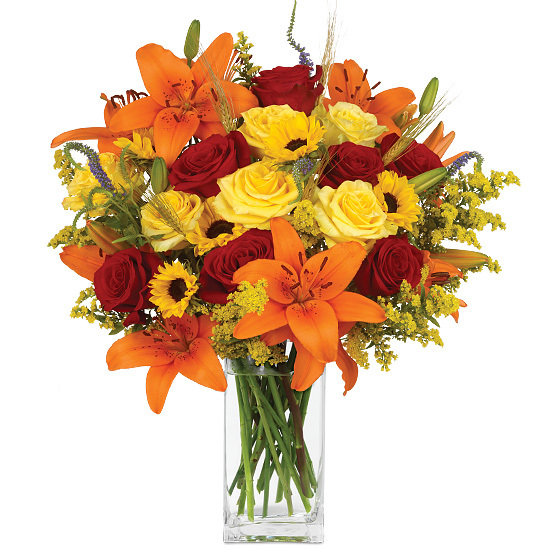 Colorful and flamboyant to say the least, its happy palette is brought to you by golden mini sunflowers, multi-blossomed orange Asiatic lilies, red Freedom roses, High & Yellow roses, purple veronica, yellow solidago, and stalks of wheat. 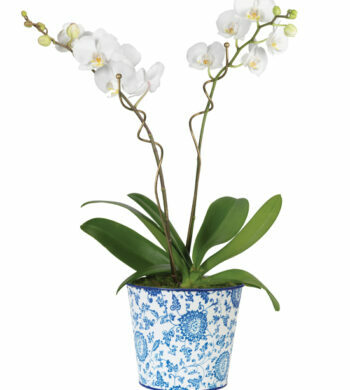 Our pretty signature glass vase lets all those blooms shine. Did you know we offer a Year of Designer Bouquets gift program in 3, 6, and 12-month installments? Remove all foliage that will fall below the water line. Remove the “guard petal” from each rose – this is the outermost petal left on to protect the bud during shipment. You may also remove any petals that may have slightly bruised during shipping. We recommend cutting all stems underwater for best blooming results. Don’t be afraid to cut! Your bouquet will look good with the different floral varieties in varying lengths. Add fresh water daily. Re-cut stems and change water every 2 to 3 days.